"Without a soul you can't get to Heaven…but you can't go to Hell either"
When faced with severe budgetary constraints in filmmaking - as most up-and-coming filmmakers are - it seems you can either try to make your film look as slick as possible or, you can work to your constraints and try to turn them to good effect. Both approaches work, but when it comes to making horror films then a less polished product can sometimes add something to depictions of darker subject matter. In Killer, Tony Elwood's first feature-length film, the total budget was $9,500. Even allowing for the fact that the film was made in the late 1980s this is hardly a comfortable sum to play around with, but Elwood and his team manage to create a competent serial killer flick which perhaps would have lost some of its appealing grittiness had it been a big budget affair. The film follows the arrival of an indiscriminate and nameless serial killer in a small American town. There is a hint of an abusive past but the killer is motiveless, attacking at random and in his own words perhaps just 'born to kill'. He moves from victim to victim until two boys from the town, Ashley and Calvin, recognise the stolen vehicle he's driving. When he realises he's been rumbled, he flees with Ashley's girlfriend Kelly as a hostage, but the boys give chase and pursue him to his hideout. They must rescue Kelly before the killer has the opportunity to indulge his cannibalistic fantasies and Ashley in particular begins to match the killer's level of violence in order to protect Kelly. The film is shot on Super 8mm film throughout, and this slightly gritty and colourful style gives Killer an immediate 'grindhouse' feel even though it was made far later than the grindhouse heyday. Maintaining this sort of atmosphere is important in a film obviously unable to layer on expensive gore effects and something which really helps here is the soundtrack devised by Leslie Mizzell. It works brilliantly well in its simplicity and really seems to add something to the film overall. There are some grisly special effects in Killer, but despite having a deal of care taken over them, I found them to be the weak points in the film: for me, the suggestion of violence works far better than seeing it in this case, and suggestion also works to the strengths of the delightfully demented lead actor Duke Ernsberger. The film really belongs to Ernsberger; he is by turns menacing, wild-eyed and never dull. He really comes into his own during some of the later scenes where he has more dedicated screen-time and his description of losing his 'soul' during his youth really is effective. 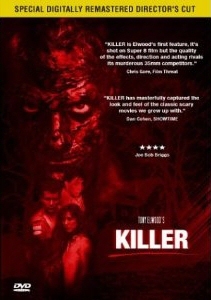 Killer is an interesting low-budget film which shows just what it is possible to do on next to no money at all. It shows some promising hints of the great things Tony Elwood is capable of and which he realised in his next feature, one of my favourite films, Cold Storage (2006). The Synthetic Fur DVD release of Killer is a digitally remastered director's cut and it boasts some great extras. The fifteen minute 'making of' documentary is a real highlight, featuring interviews with director Tony Elwood and writer Mark Kimray. It's an insightful quarter of an hour as Elwood and Kimray discuss their earliest work (with clips!) why they decided to make a horror movie, and issues surrounding funding, budgeting and casting: basically they answer all the questions film fans would really want to ask. There's also an audio commentary with the director, writer and cast members, and an extensive behind-the-scenes photo gallery.